Nicolas was Born in Epsom, England in 1955. He grew up in a new estate in the countryside where he developed an interest in birds from the age of 18 months. Arriving in Australia in 1965, the family lived briefly in South Australia before settling in Victoria, where his interests gradually broadened to include all aspects of natural history with birds still at the forefront. An interest in drawing also developed from an early age, but it was the quest to see and experience nature that was the dominant pursuit. Some bird drawings were shown at an interview for a keeper job at Melbourne zoo and it was soon after this that he was given some time away from feeding and cleaning duties to paint identification signs for the aviaries. At this time the wildlife artists society was being formed and Nicolas met some of the artists visiting the zoo, and was encouraged to attend some of the meetings. Several of the artists became his mentors and his work began to develop more seriously. Increasingly, frustration with mundane zoo work led to his resignation, and he began to paint full time in 1976. Ninon Phillips, Richard Weatherly, and then Charles McCubbin and Peter Trusler mentored Nicolas during the first part of his career. 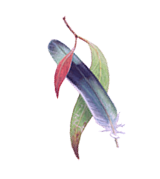 Importantly, Ninon introduced Nicolas to to the publisher Lloyd O'Neil who was keen to produce a major new Australian bird field guide. The opportunity to backpack in Europe for 3 1/2 months was taken just before Nicolas commenced work on the new field guide (Field Guide to the Birds of Australia - Simpson & Day). Peter Trusler was appointed art director - the two making a happy and dedicated team for the 7 day a week , 2 year task to complete the book illustrations. In 1985 Nicolas bought some land and began work on his house-studio in the bush in South Gippsland. He also travelled more extensively, often he led art teaching courses like those at Birds Australia Observatories. This enabled him to observe many more birds and their landscapes. As well as illustrating more books and articles, Nicolas worked to commissions and for exhibitions, gradually amassing a number of prizes and commendations. Throughout his career, particularly in the early years, he has been very active in outdoor pursuits, - skin diving, canoeing, hang gliding, and bush-walking - all went hand in hand with travelling and nature watching. During the 1990's his activities reverted steadily to bird study and work with a rekindled interest in photography as a hobby. He has had one bird magazine cover photo and exhibited others. One of the main objects of photography being an extension of bird observation and sketching as reference material for illustration and gallery painting.